A bit of a mystery, we have a Montreal Canadiens jersey that was worn by a player during training camp in the late-1990s/early-2000s with the surname “Fritz”. 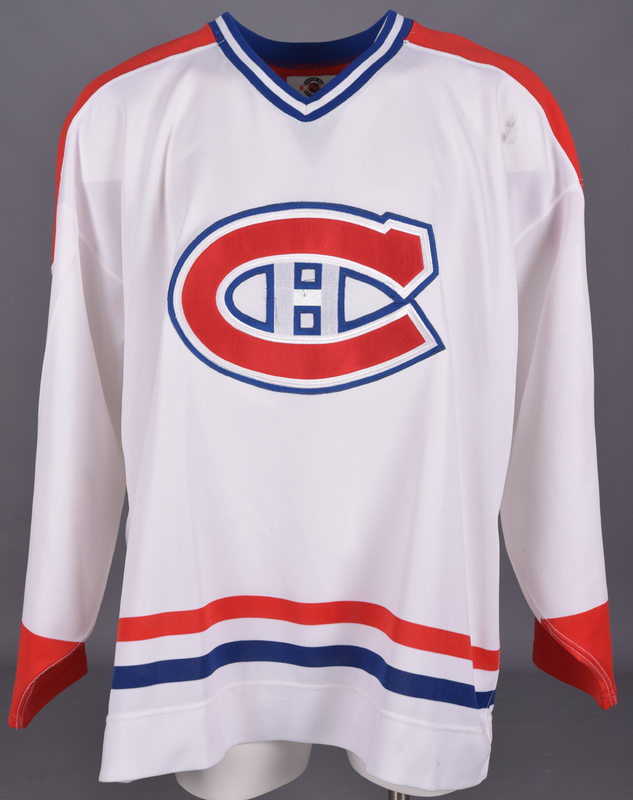 With evidence visible of a former nameplate, a Center-Ice label from Starter graces the collar, with a “58-R” size swatch over the inside hem. Styled with the most famous team crest in hockey, “53” appears over the sleeves and verso in red, white and blue layered tackle twill, with “Fritz” across the affixed nameplate in single blue twill. A few dark marks are visible over each sleeve and beneath the left shoulder, with a few loose threads on the team crest. There is also red and blue paint transfer over the lower left sleeve, along with faint board burns. A team LOA will be included, signed on behalf of the Canadiens by Rejean Houle.